Pam’s Simple Recipes Mod 1.12.2/1.11.2 for Minecraft is a small mod among many mods programmed by a great Mod Developed called Pam. 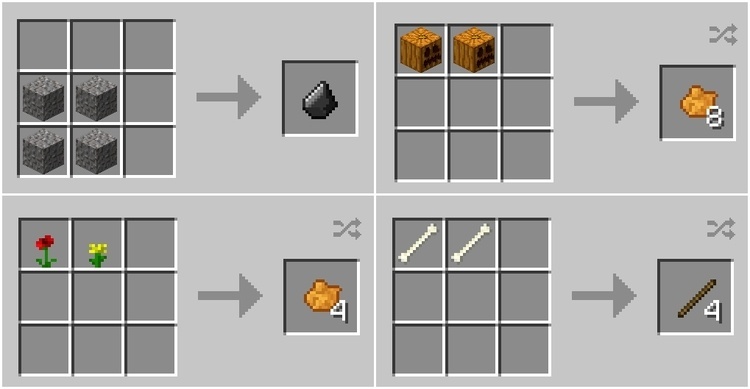 Some significant famous mod designed by Pam in Minecraft world are Pam’s Harvest Craft, Pam’s Bone Craft, Pam’s Desert Craft,… Besides, he creates many small mods to support the new player in Minecraft, and Pam’s Get All the Seeds is one of them. From now, it does not matter with player anymore. With Pam’s Simple Recipes you can create an item from an inapplicable recipe. These recipes help you shorten step in generating new item by making use of major useless item or item that takes you a lot of steps to create. Besides that, Pam’s Simple Recipes allows you to generate saddle. Before player just can get saddle by luck. Pam’s Simple Recipes requires Forge Mod Loader and Minecraft version 1.9.4/1.10.2/1.11.